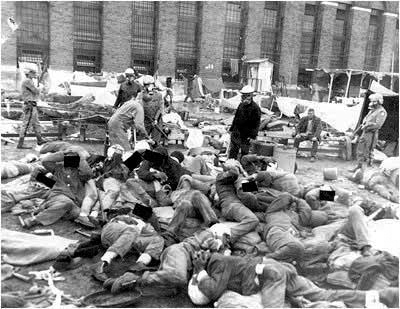 Sept. 9 marks 40 years since the uprising at Attica State Prison in upstate New York and the deadly and sadistic retaking of the prison – and mass torture of hundreds of prisoners all the rest of the day and night and beyond – by state police and prison guards on the morning of Sept. 13, 1971. When the shooting stopped and the gas lifted, 29 unarmed prisoners and 10 hostages were dead, slaughtered by the assault force. Over a hundred more prisoners were shot, some maimed for life and many others seriously injured. Attica and its aftermath exposed the powder kegs ready to explode inside the U.S. prisons, and the urgent need to change the reigning penology and administrative practices throughout the federal, state and local prison systems. Attica uncovered the hidden reality that the prisons and jails were increasingly the socio-economic destination for the poor and largely disproportionate numbers of Black people, as well as political militants. The Attica prisoners’ demand for human rights also revealed that both men and women were treated like modern day slaves in prison, denied minimal humane treatment, decent medical care and fundamental constitutional rights. Attica and its aftermath exposed the powder kegs ready to explode inside the U.S. prisons. Attica uncovered the hidden reality that the prisons and jails were increasingly the socio-economic destination for the poor and largely disproportionate numbers of Black people, as well as political militants. It is true there was much liberal sentiment expressed for prisoners in the wake of the rebellion and massacre and a small flurry of activity in support of prison reform, involving recognition that prisoners had some rights and the need for rehabilitation programs to prepare them for release. There was even some concern raised about the racist underpinnings of law enforcement and the entire criminal justice system. These efforts at reform, however, in comparison to policies already in motion to make the prisons chiefly into warehouses for the unemployed and internment camps for militants were minimal and soon largely abandoned. The Nixon administration, sweeping into office on the cry of “law and order,” was determined to use federal government power to destroy what it considered a radical domestic insurgency, which it believed threatened the very existence of the capitalist society. Following the urban uprisings in Harlem, Watts, Newark and Detroit, numerous confrontations between the police and members of the Black Panther Party and other militant organizations and the massive movement in opposition to the Viet Nam war, the government, calling for greatly expanded police powers, passed the Omnibus Crime Control and Safe Streets Act of 1968. The act established enhanced powers for the police to carry on a “war on crime,” including procedures to allow wiretapping by law enforcement and relaxed standards to admit confessions. The act also created the Law Enforcement Assistance Administration (LEAA), which over the following years provided more than $5 billion in extra funding for state and local police and for new prisons. While small amounts of money were given to non-institutional reform projects, the vast amount of resources was provided to police departments all over the country for SWAT-type counter-insurgency training, high-tech weapons and surveillance hardware and to build and equip more secure prisons. Thus Attica served to reinforce the Nixonian idea that militarized repression and high security prisons were needed to confront the growing militancy facing the country. Certainly, in the few years before and after Attica, there was clear evidence that assassinations and frame-ups of radical political leaders was the policy promoted and funded by the administration. 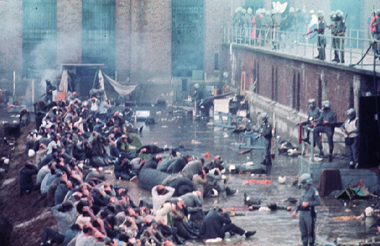 Attica served to reinforce the Nixonian idea that militarized repression and high security prisons were needed to confront the growing militancy facing the country. As was made clear in court cases and other investigations, the murders of Fred Hampton and Mark Clark – and George Jackson – and the frame-ups and imprisonment of Geronimo Pratt, Dhroruba Bin Wahad, the Wilmington Ten and the Omaha Two are only a few examples of this policy in action. Some political militants still languish in prison today, over 35 years later. The rebellion at Attica was clearly viewed as a reflection and confirmation of the perceived threat of domestic insurgency; indeed, Nixon called to congratulate Gov. Nelson Rockefeller after the massacre. 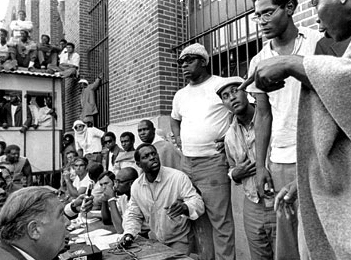 The political speeches and militancy of the Attica prisoners, many of whom identified with the Black Panther Party, the revolutionary nationalism of Malcolm X, or the teachings and discipline of the Black Muslims did not go unnoticed by the forces determined to suppress any movement for Black liberation. The government was increasingly well aware of these ideas and movements and was determined to destroy them. Thus the massacre and torture should not be viewed as bad decision-making by New York authorities or roguish action by the police, but as simply the most savage and bloody of countless acts of conscious repression which took place all over the country and showed the political intention to destroy the Black Movement and defeat and intimidate its supporters. Its aftermath also represents the further development, not of liberal efforts towards prison reform, but of the use of the prisons as an integral part of the program and apparatus intended to control and sequester America’s economically marginal, politically ungovernable populations. The incarceration numbers clearly tell the story. For almost 50 years prior to Attica, the U.S. incarceration rates were constant and commensurate with those of Western Europe. Beginning in 1972, however, the rates rose steadily for the next 35 years, and Blacks and Latinos were locked up in hugely disproportionate numbers. In 1972 there were about 300,000 people in federal, state and local prisons combined. Today the number is over 2.3 million. The United States, with just 5 percent of the world’s population, has 25 percent of the world’s prisoners, the world’s highest per capita imprisonment. Prisons are an integral part of the program and apparatus intended to control and sequester America’s economically marginal, politically ungovernable populations. The “prison-industrial complex,” comprised of bloated “corrections” bureaucracies and the companies they do business with, and fueled more and more by private prisons owned by huge corporations, has become a multi-billion dollar industry. The annual budget in California alone is more than $7 billion – meaning an average of roughly $50,000 per prisoner per year. By the beginning of the 1980s, after the destruction of the Black Liberation Movement, the incarceration policies continued under the banner of the “war on drugs” and the ramped up fear of crime, and young Black and Latino men were often demonized as predatory threats. The flooding of crack cocaine into poor Black communities, in some cases facilitated by law enforcement complicity, and the Reaganite “voodoo trickle-down economics” created the ideal circumstances to continue the obscene incarceration juggernaut. In lieu of decent jobs and education, poor people were given militarized occupying racist police and draconian punishments, including mandatory sentences and three strikes life imprisonment. Those behind the walls who understood this oppression and wished to educate other prisoners were often isolated and buried alive in special isolation control units. In lieu of decent jobs and education, poor people were given militarized occupying racist police and draconian punishments, including mandatory sentences and three strikes life imprisonment. Moreover, unlike the Attica prison rebellion, which was broadcast around the world, the media more recently generally ignored the explosion of numbers and, until just lately, the costs: the conditions of confinement – poor food, indifferent medical care, no education or training programs, arbitrary parole denials – and the swelling numbers of prisoners locked up permanently in sensory deprivation cells, which constitutes mental and psychological legalized torture. Absent a dramatic cry for help, like a hunger strike or a riot, the voices and plight of prisoners are generally ignored. Certainly the shame of the U.S. prisons is never even mentioned by the Obama administration, let alone addressed. Absent a dramatic cry for help, like a hunger strike or a riot, the voices and plight of prisoners are generally ignored. George Jackson said, “The ultimate expression of law is not order; it is prison.” In the absence of vibrant movements for liberation and human rights, directed by militant activism, we are saddled with a society run wholly in the interests of the banks, the military, the big corporations and the rich people, which have no other accommodation for huge numbers of people at the base of the socio-economic pyramid except prison. What we need is not marginal reform that makes life a little better for those now – and soon to be – locked up, but a thorough revolutionary change in a political system resting on such a corrupt base. Real “hope and change” will only begin to emerge when we dismantle the racist, class-based criminal justice system and allow those who are oppressed at the work place, in the community and in the prisons to freely organize and fight for justice. Michael E. Deutsch, a partner in the Chicago People’s Law Office, was one of the criminal defense and class action civil rights suit attorneys for the Attica Brothers. The civil rights suit was settled for $12 million in 1999. This commentary first appeared on the blog Break All Chains. thank you so much to tell us the truth about USA, of the past and the present. I refuse to forget, information is power! that we have to share.